The Knog Oi Bike Bell is marketed as a bicycle bell which doesn’t look like or sound like an ordinary bike bell. The most striking thing about the new Oi Bell is that it has a very slim profile. This makes it easy to fit on the handlebars. The sound is quite pleasing (a bit like a glockenspiel) and quieter than an ordinary bell. The ringer is also small and the first few times when I reached for the bell I missed the ringer at first glance. This was due to my reflexes being used to reach for my previous bigger bell. After getting used to the new position on handlebars it is fine. But then, on the other hand, you can ring your bell three times and the people are immobile – standing in the road or cycle path; when you go past, they mutter sarcastically ‘Don’t you have a bell?’ The problem with this bell is that it is quieter than ordinary bells. On a windy day on the footpath or during noisy traffic, the sound is easily lost in the environment. 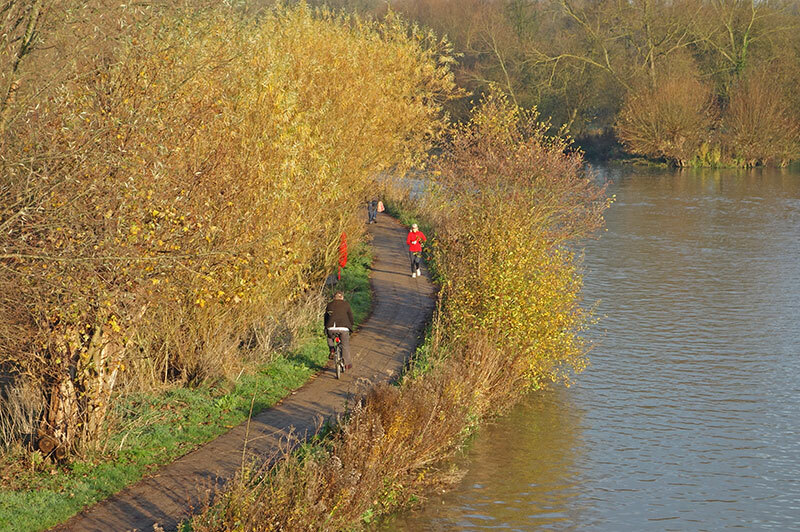 When using this cycle path by River Thames I often timidly ring my bell because I don’t want to sound like a menacing cyclist wanting people to jump out of the way. But, when I timidly ring the bell, they often don’t hear. This Knog bell is quite good if you want to err on side of not ringing too loudly. The sound is certainly not threatening, but at a distance might not be heard at all. The problem is if people don’t hear, the bell becomes a mere ornament. The bell fits handlebar sizes 22mm – 31.8mm diameter. It was easy to attach. I have had problems with old bicycle bell breaking. The internal spring mechanism goes. This seems simpler design just using the shape of the bell to create the sound. It looks good quality machine drilled metal. I got a free bell for review. 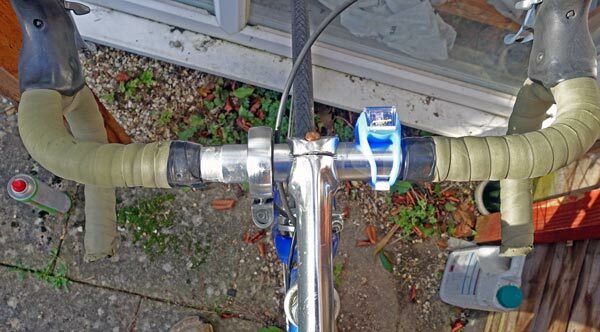 At £13.99 you can definitely find cheaper bike bells. For an extra £10, it does offer value added compared to another bell. Overall, I do like the stylish design of this bell. It takes up less space and the sound is pleasing. On my battered old commuting bike, such a stylish accruement is a little lost, but if I upgraded to a vintage bike, this would fit in quite nicely. 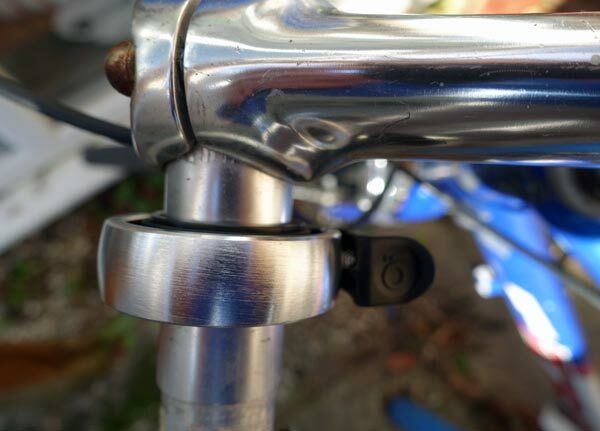 The main conundrum is of optimal sound for a bike bell. Sometimes people don’t hear an ordinary bell, this one at a lower volume is more prone to that problem. But then, on the other hand, when I had a loud bell, I often tried to make it quieter. I think it really needs to be a bit louder to be useable in all conditions. The ideal bell would have an option for variability in volume. I’ve never used a bicycle bell on a training bike. Who wants to put a big old bike bell on their Trek Emonda? But, this bell makes it a possibility. It would fit into the style of a road bike whilst leaving space for Garmin, lights and hands on the handlebars. 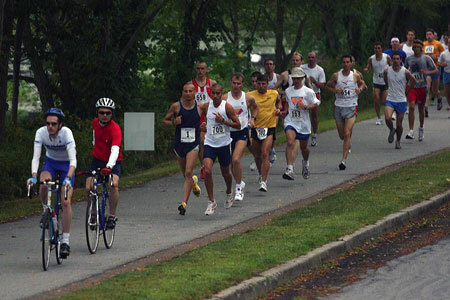 Once a year in Woodstock, NY I act as the lead cyclist in the Sri Chinmoy Marathon around Rockefeller State Park. It involves spending three hours of cycling very slowly and ringing a bell to warn lapped cyclists the lead runner is coming through. This bell would be ideal for that particular job as the sound is just right. Old bike bell. Big, solid and loud. 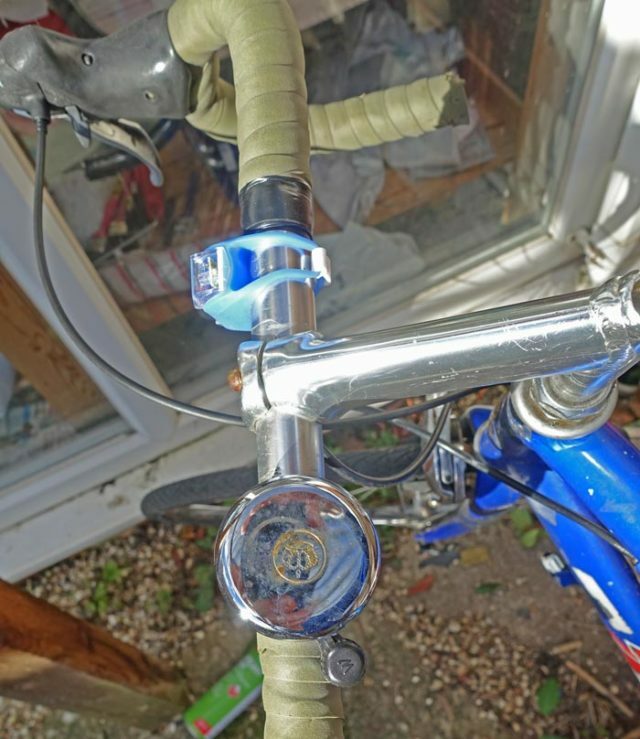 Bike bell from overhead blends into stem and handlebars. After six months, it broke, but I was able to fix the ringer. However, after 18 months, it broke again (no longer made ring) I couldn’t see how to repair so I threw away. Dissappointing as a bell should last much longer than this. You speak the truth when you refer to cyclists being damned either way. If you don’t ring a bell you’re inconsiderate for not warning people of your imminent arrival (as they step into the cycle lane gazing at their phone). If you do ring a bell you’re the equivalent of Mr Toad shouting “get out of the way!”. My preference is for a large loud-ish but friendly sounding bell. A nice dring-a-ling, rather than one of those plain and cheap “ding” bells that some on bikes by default these days. The spring in Oi bell is a joke. It bent after 2 months of usage in a way it is hard to ring at all.